Q: Do you guys sell loans really cheap to private companies? Because we’re interested. Q: Really? Not at all? A: Well, to two companies. Q: Two private companies in the whole nation? Q: OK, but we’d like to buy some, and we’ve got serious money to do it with. Like, millions. A: Oh, well… maybe. 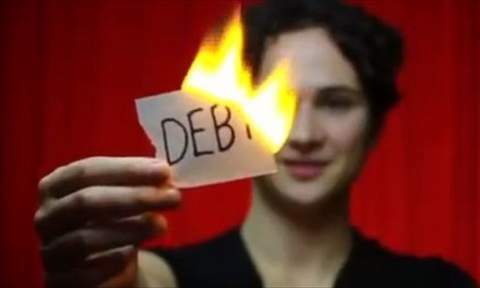 Why do you want to buy student loans? A: Wow, that’s uh… crazy. But anyway, why are we talking about this? We don’t sell loans to private companies. Q: That’s not true, you just told me you did. A: No, we don’t. You misunderstood. Please leave. Please follow Rolling Jubilee, consider donating, consider telling all your friends about it. This is Old Testament economic practices done with candor, strength, and ingenuity. I love this. Rolling Jubilee is not currently taking donations, but I think the Sept 17 announcement suggests that they’ll start again then. Until there, here’s ways you can help now.